We now supply the Injector Dynamics product range for a variety of vehicles in a number of injector sizes to suit your vehicle. 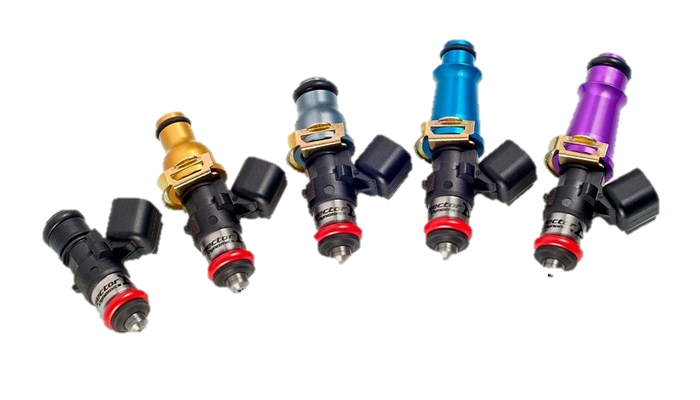 The team at Tarmac Sportz loves everything about fuel injectors, the sound of them activating, the burst of speed - they are a fantastic way to get more out of your engine. Injector Dynamics design, develop and test their products in-house and with their partnership with BOSCH, can provide high-quality injectors through state of the art testing equipment. A results-driven company, Injector Dynamics values important metrics such as idle quality, tunability, consistency and accurate data. They are one of the best manufacturers of fuel injectors that you are going to find. Injector Dynamics products have been designed to give your engine that extra boost, to give you more power when you need it. The fuel injectors in this collection range in airflow capability so you can match with your particular engine size. They manufacture fuel injectors for an enormous variety of car makes; Audi, BMW, Ford Focus, Infiniti, Lexus, Mazda, Mitsubishi, to name a few. There are fuel injectors of all air flow capacities; 725cc, 850cc, 1000cc, 1300cc, 1700cc and 2000cc. The ID1000 was a first in a number of ways for Injector Dynamics and for the industry as a whole. This 1000cc injector was the first that Injector Dynamics manufactured, and was also the first to boast a number of revolutionary features to the motorsport community. It’s a versatile injector that will serve you on the road and on the track, with its maximum pressure capability of 7 bar and a smooth response at low flow. It has been designed to create an enhanced driving experience. It will serve you just as reliably as it has been serving so many other enthusiasts ever since it was introduced and changed the market forever. That’s only one example of Injector Dynamics’ top-quality fuel injectors. Have a look at our range to find the perfect fuel injector for your performance car. The only motorsport injector supplier that is providing emissions compliant high flow injectors to original equipment manufacturers. That’s a concrete indicator of Injector Dynamics’ quality and expertise. A manufacturer only becomes a supplier to OE manufacturers by being the best. Injector Dynamics’ partnership with Bosch is more than just a badge to wear proudly, though wear it proudly they do, it demonstrates a genuine passion for quality and commanding expertise of safe and efficient car component design and manufacturing. The partnership grants Injector Dynamics access to the highest level of automotive technology and expertise. One of the ways that Injector Dynamics has achieved this status for reliability and excellence is their unparalleled testing equipment and methodology. All of their flow test equipment is designed and built in-house, it’s got pressure capability from 1-10 bar and temperature capability from 0-80°C, compatibility with all fuels and it meets or exceeds all industry standards.